Pneumatic damper drives are excellent alternatives to electric drives because of speed, accuracy, and reliability. 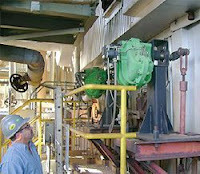 Pneumatic vane damper drives don't have gears or motor windings that slow down response or introduce slop. 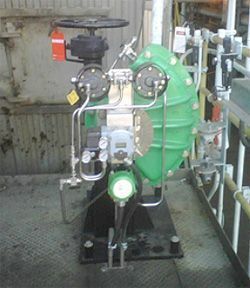 Pneumatic vane drives react to signal changes and produce movement instantaneously and repeatably. In flue gas and combustion air applications, rapid response is critical for optimal efficiency, safety, and equipment longevity. In power plants, Rotork Type K damper drives provide a better solution for critical damper applications over electric drives. Balanced-draft power generation boilers can experience very serious equipment failures if low pressure conditions exist inside the combustion chamber. 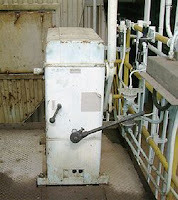 Transients in boiler pressure can cause combustion complications leading to irregular heating of steam tubes, and in extreme situations, negative boiler pressure can collapse boiler walls and buckstays. There is a possibility for catastrophic failures (ruined boiler tubes, destroyed refractory, boiler structural damage) leading to long shutdowns, lost production, and expensive re-construction. Understanding the catastrophic possibilites, it is extremely important to provide consistent internal operating pressure environment for efficient and manageable combustion. ID (induced draft) fans on combustion boilers play a critical role in maintaining reliable boiler pressure. In turn, the ID fan inlet damper control system that regulates fan induced airflow and pressure need to be accurate, responsive, and reliable to assist in keeping boiler combustion chamber pressure fluctuations in check. Rotork Type K 'PM Series' Pedestal-Mount TK-6 Damper Drives have proven themselves time and time again to be the best choice for these applications. Pneumatic vane drives deliver high torque at tested speeds of less than 3 seconds for a full 90-degree stroke. They offer drop-in-place retrofit to the existing damper drive footprint, plus smart positioner technology. The Type K Drives perform quickly and smoothly at full boiler pressure and damper load, and as required, fail to the fully closed position. For use on boiler dampers, the years of maintenance-free operation, in thousands of successful installations world-wide, the data clearly demonstrates pneumatic drive's superiority over electric drives. Finally, always discuss your damper drive application with an experienced applications engineer for best selection, optimal performance, and maximum safety.